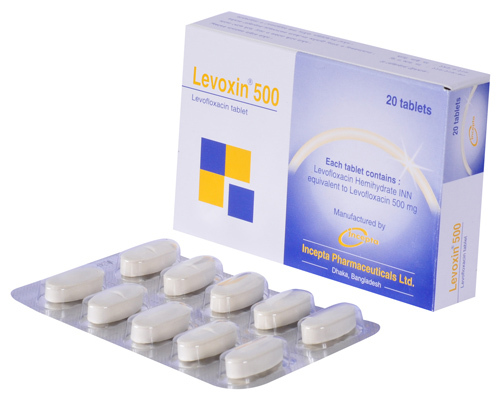 Levoxin 250: Each film coated tablet contains Levofloxacin Hemihydrate INN equivalent to Levofloxacin 250 mg.
Levoxin 500: Each film coated tablet contains Levofloxacin Hemihydrate INN equivalent to Levofloxacin 500 mg.
Levoxin 750: Each film coated tablet contains Levofloxacin Hemihydrate INN equivalent to Levofloxacin 750 mg.
Levoxin 100 ml oral solution: Each 5 ml solution contains Levofloxacin Hemihydrate INN equivalent to Levofloxacin 125 mg.
Levoxin IV Infusion: Each 100 ml solution contains Levofloxacin Hemihydrate INN equivalent to Levofloxacin 500 mg.
Levofloxacin is a synthetic, broad-spectrum, third generation fluoroquinolone derivative antibacterial agent. Chemically levofloxacin is a chiral fluorinated carboxyquinolone. - Enteric infections caused by Enterobacter sp., Escherichia coli, Campylobacter sp., Vibrio cholerae, Shigella sp., Salmonella sp. 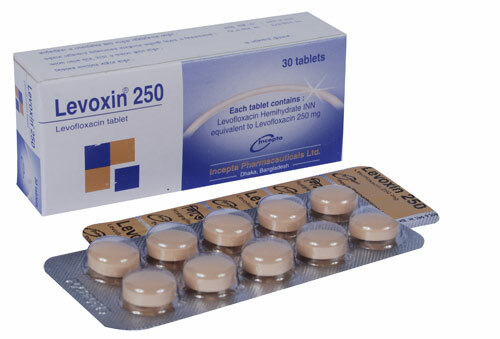 The usual dose of Levoxin Tablets is 250 mg or 500 mg or 750 mg administered orally every 24 hours. 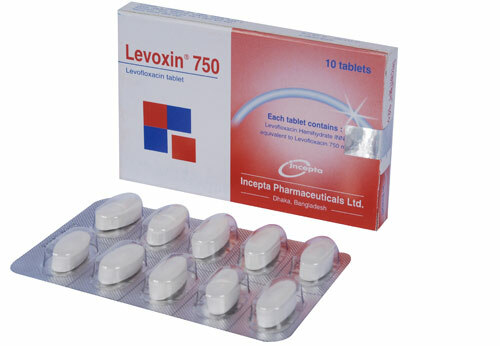 Levoxin tablets can be administered without regard to food. Levofloxacin oral solution should be taken 1 hour before, or 2 hours after eating. 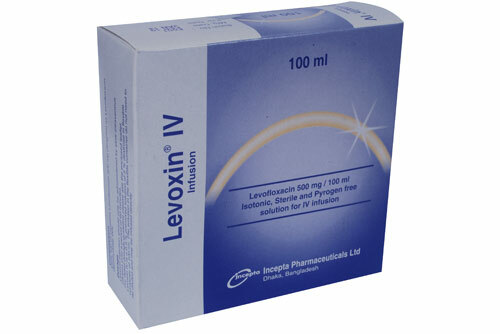 Levoxin injection should only be administered by intravenous infusion. It is not for intramuscular, intrathecal, intraperitoneal, or subcutaneous administration. The usual dose of Levoxin injection is 250 mg or 500 mg administered by slow infusion over 60 minutes every 24 hours or 750 mg administered by slow infusion over 90 minutes every 24 hours. Since the Levoxin injections are for single-use only, any unused portion should be discarded. Additives or other medications should not be added to Levoxin Injection or infused simultaneously through the same intravenous line. In each case, sequential therapy (intravenous to oral) may be instituted at the discretion of the physician. Levofloxacin is generally well tolerated. However, a few side-effects can usually be seen. Side-effects include: nausea, vomiting, diarrhea, abdominal pain, flatulence and rare occurrence of phototoxicity ( 0.1%). Side-effects that may be seen very rarely include tremors, depression, anxiety, confusion etc. - Levofloxacin Injection should only be administered by slow intravenous infusion over a period of 60 or 90 minutes depending on the dosage. 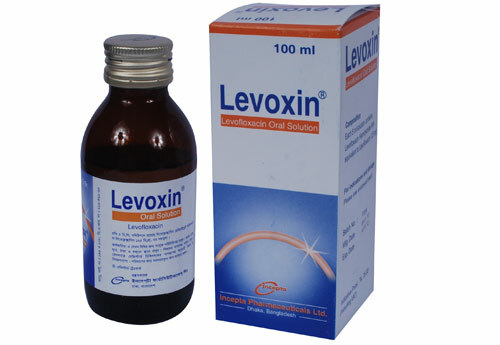 - While administrating Levofloxacin, adequate amount of water should be taken to avoid concentrated form of urine. - Dose adjustment should be exercised during Levofloxacin administration in presence of renal insufficiency. Levoxin eye drops should not be injected subconjunctially, nor should it be introduced directly into the anterior chamber of the eye. Avoid contaminating the applicator tip with material from the eye, fingers or other source.